There is one wintry day that I remember with exceptional fondness. My brother, sister, and I had piled into the bed of my father’s truck, which had a cap, and sealed it up tight and cozy. We brought with us every blanket in the house, probably a stuffed critter or two, and huddled together in our newfound fortress. My gracious mother made us a thermos of hot cocoa and several bags of microwave popcorn. 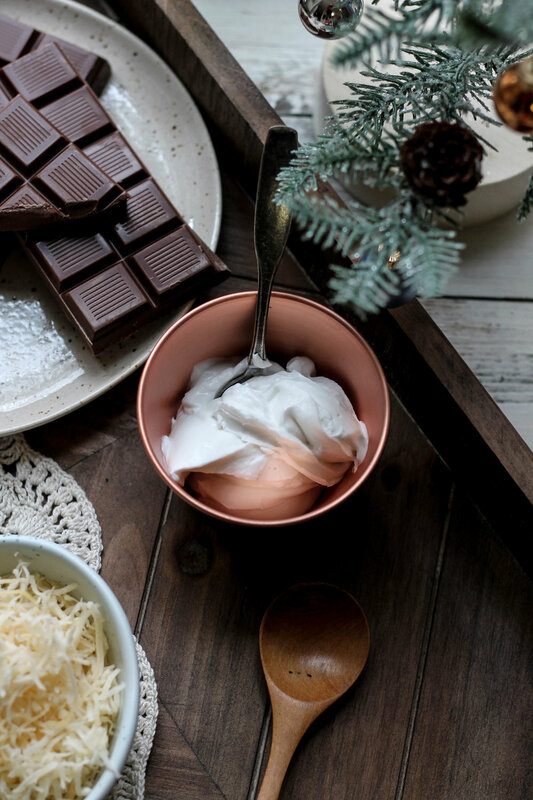 Snow was falling, and we gripped our steaming miniature mugs as though that chocolatey brew was the only thing standing between us and frostbite. I would happily hop into the back of that truck today, though we probably could no longer sit up without hitting our heads, and my brother probably wouldn’t want to cuddle up with his sisters anymore, but I would give anything for even a taste of that long-lamented magic. Last week, I attempted to stir up (pun intended) some of that childish magic as I made this hot cocoa. Though his culinary instincts were not at their sharpest at the time, he did make one suggestion that was rather brilliant. 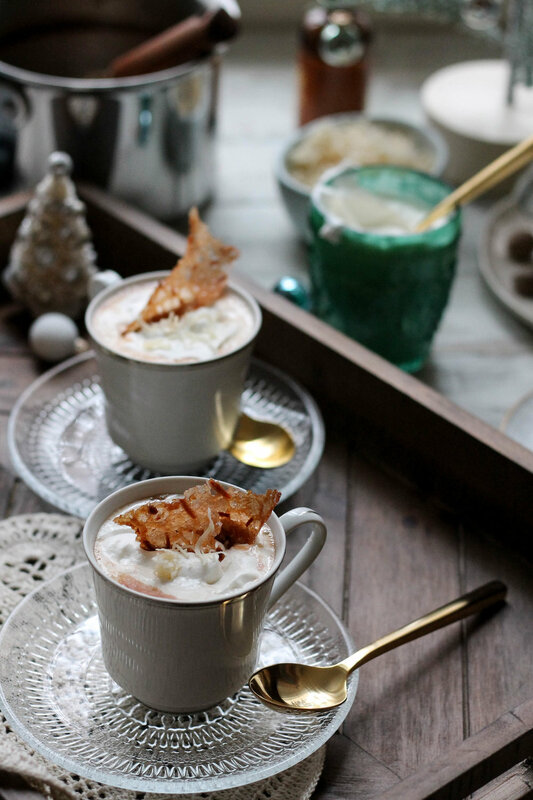 Coconut Cream Hot Cocoa. Medicated stupor aside, where there is cream and chocolate, there is happiness. The days have been cold, the mornings colder, and I am yearning for that long lost comfort that came in the form of the bed of a hefty green truck, cuddly siblings, and packet after packet of Swiss Miss. Today there are no siblings to cuddle with and no truck bed to crawl into, but I have my cocoa and the warmest of memories to shield me from the blustery world that lies around me. Now go grab some chocolate, you’ve got work to do. Cheers to the good old days that inspire the good new days. In a small bowl, whisk to combine sugar and flour. Whisk in melted butter, salt, water, and coconut. Cover the bowl and refrigerate for one hour; or until firm. Preheat oven to 325 degrees and line a baking sheet with a silicone baking sheet. Portion the chilled mixture into 1/2 teaspoon balls, spacing them about 3-inches apart. Bake for 7-9 minutes, until they are deep golden in color. Remove from the oven and allow to cool for one minute before removing from the pan. You may shape them gently before they cool, or allow them to cool on the pan completely and then break into pieces. Beat heavy whipping cream on high speed with an electric mixer until soft peaks form. Reduce speed to low and mix in confectioner’s sugar and coconut cream. Refrigerate until ready to use. Combine whole milk, coconut cream, and granulated sugar in a medium saucepan and place over medium heat. Stir the mixture often until the sugar is dissolved and the milk is steaming. Remove from heat and add chocolate; stir until smooth. Stir in nutmeg and vanilla. 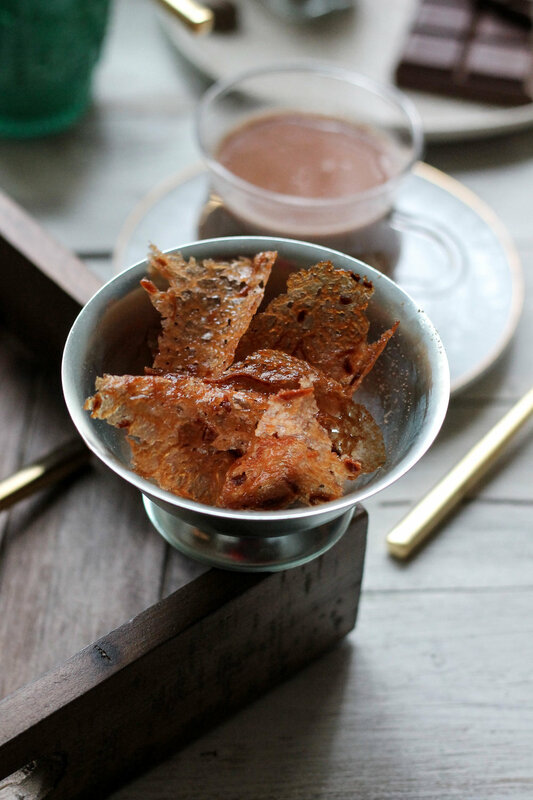 Serve hot with heavy spoonfuls of whipped cream and a coconut tuile. Put in charge of the vegetable side dish this Christmas and really wanting to offer up something besides corn casserole or green beans? I feel you. From the looks of my Instagram feed, I think most of us set up our trees over the weekend. I know this may be shocking to some of you, but I am really not a big fan of stuffing. Want to make fancy pretzels with me? Yay! Let's do it together.